I’ve been toying with the idea of going “half-raw” for a while. I doubt that that’s the technical term. I like the idea of the raw food movement, but I’m still quite attached to certain things. Like my stove… Pies… Steak… Cheese… I could go on for days. So, though I like the general idea behind raw food, I’m just not ready(nor do I think I ever will be) to give up all the tasty things that are allowed in a normal person’s diet. So I’m gonna phone it in and go half-raw. As much as I can. I will have my cheese and eat it too. Tonight, I decided to test the waters and stick my toe into the shallow end of the raw food pool. I’ve heard of similar dishes to the one I made-zucchini “pastas” are quite plentiful in the raw foodist’s recipe roladex-but I haven’t seen them with much more than just tomatoes and celery thrown in a blender. Well, that just doesn’t cut it for us here at Rockaberry. Boring is NOT the new black, and I demand a certain level of taste and excitement in my food. Especially vegetable dishes, which I am honestly not too fond of with the absence of heat. However, this dish exceeded my expectations. I can’t possibly begin to explain how good it was except for to say that I would have run to the grocery store for another zucchini had it been open because I wasn’t ready to let go of the experience. See for yourself! Recipe to follow. Soak sundried tomatoes and bay leaf in boiling water for ten mintues. Using a vegetable peeler, peel the zucchini into strips, all of it. Cut the strips lenghwise into a long julienne. Drain the tomatoes and discard the bay leaf, reserving about 1 tbsp of the water. Place all ingredients into blender except(!) zucchini and feta. Blend until smooth, adding reserved water to thin if needed. 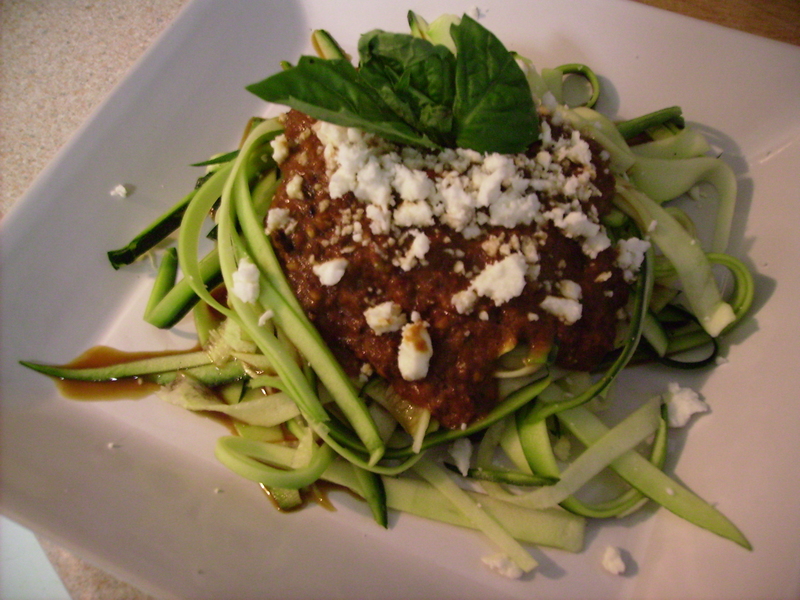 Top zucchini with blended sauce, and sprinkle with feta. Best enjoyed while gawking like a yokel at a burning building, or possibly while watching So You Think You Can Dance, if you happen not to be lucky enough to have a towering inferno to gape at.